I like green - it's all around me in the bush, on my blog and in my stash. For several months I have had them arranged so I can touch and admire them but I think I have finally found a pattern that can use some of these single skeins and still preserve their unique appeal. Here is Lady of the Lake and the Celtic Vest, both sideways knitted patterns from Fleece Artist, previously only available to me in kit form. I have been yearning for these patterns for a long while so when Little Knits offered them for sale with with a special offer of Fleece Artist Country Mo I snapped them up. I put off buying the Mo because I already had this lovely green collection of green mohair and because of several unfavourable reviews I read about the yarn. I am nearly finished the Zimmerman Rib Warmer in the New York Manos del Uraguay - also green, all three skeins of it. Three skeins is not enough to complete this pattern by the way, but by a wonderful happenstance I have a ball of local market handspun that matches the colour exactly. 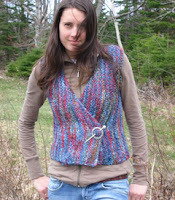 The finished vest will have a Yoke of Blue Mountains Handspun to match the handspun of Uraguay. Oooh! That's such a lovely combination of greens. And I bet it's going to be a luscious tactile mix. Looks like it will be a wonderful project--those greens are delicious! And how nice that the local handspun will be able to pair up with the Manos--another example of the interconnectedness of it all!